If you are 20 years old on planet Earth, your age will be almost half (about 10 martian years) on planet Mars. Even your birthday date will come quicker on Mars than it comes on Earth. How is this possible and does this sound confusing? Well, if you live on other planet (except Earth) your age, birthday date will be different and even your body weight figure will vary. There is no need for complex research, you can use online tool to calculate your probable age, birthday date and weight on different planets of the solar system. 1. Open your age on other worlds webpage. There you should see photos of different planets and few text boxes. 2. Enter your birthday date in (month – date – year) format and click Calculate button. 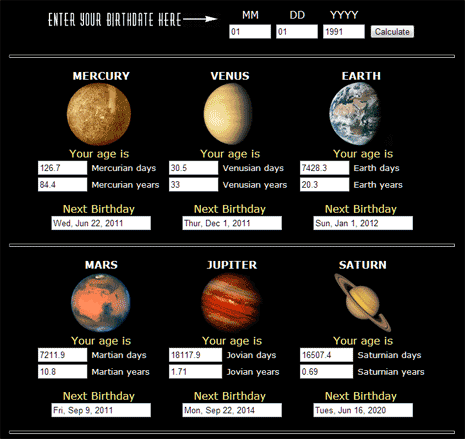 This web tool will calculate your age and birthday date on other planets based on your birthday date on planet Earth. 3. Once you click Calculate button, you should see your birthday date and age on other planets like Mercury, Venus, Earth, Mars, Jupiter, Saturn, Uranus, Neptune, Pluto. Calculations are interesting, as you will have different age on different planets. Earth takes one year or 365 days to complete one revolution around the Sun. Other planets take different number of days to complete one revolution around the Sun, this results in different age figure. For example: Mercury takes 88days while Pluto takes 248years to complete one revolution around the Sun. Since your age is different, the birthday date will also be different. So, now you want to travel to a different planet? 1. Open your weight on other planets webpage. It has options to show calculation for different planets, stars and moons of Jupiter. 2. Enter your current weight figure and click Calculate button to see your possible weight figure on other planets. 3. Your weight figure will be displayed for each planet. Your weight will be maximum on Jupiter planet and least on the Moon. 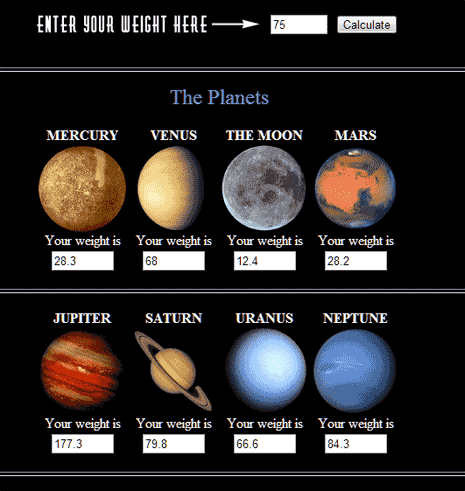 Weight calculation different on each planet due to different level of gravity. This in turns effect the mass and distance of object resulting in varying weight on each planet. Want to travel to different planet to feel lighter? Show Snow on Wordpress Blog, its Christmas Time !